Bigger, faster, better: How is Microsoft helping partners win more business? There have been some flagship events recently where Microsoft leaders have shown how they are focusing on working better with Microsoft partners, to help them grow their businesses most successfully based on Microsoft products and technology. Microsoft ran another very successful Partner Days session at Twickenham Stadium, London, UK on April 24th and 25th. Hosted by Joe Macri, Vice President, UK One Commercial Partner, the key strand running through the two days was how Microsoft is focused on making it easier for partners and customers to engage with each other. In his scene setter for Day 1, Joe said that in the conversations he has with partners about where help is most needed, the most common feedback is how and where MS can help partners grow their businesses for mutual benefit. In Day 2, he confided that since the launch of One Commercial Partner, Microsoft has been too focussed on the “What?”. As David Gersten wrote about One Commercial Partner (OCP) last year, the focus was on What is Build With, Go to Market, Sell With? Partners have since been telling Joe they get that, but what they need to also know is ‘Why?’. Sue Preston is Director of Solution Sales and introduced her Deal Clinics Initiative – Engagement / co-collaboration to accelerate the sale. It’s essentially a set of review sessions with partners to produce industry-focused, business-action defined outcomes. A key benefit is that these often helps bring the various separate parts of Microsoft together to help drive the deal, following the “One Microsoft” message. Microsoft has an unrivalled spread of technology which can combine to provide great solutions and win deals; the review sessions in the Deal Clinics Initiative is a great way to get this rolling. As an example of how this works, Sue introduced Steve McBride from New Signature, who talked about the Deal Clinics and how this led to effective joint customer meetings with Microsoft and various partners to address all aspects of a deal. Not only did the Deal Clinics really help in careful sales qualification (helping partners sift opportunities much better and focus only on the best ones) but it also led to multiple SOWs running concurrently with more to follow. Anna-Victoria Fear covered how leading partners are most effectively working with customers on cloud projects: there’s a new phrase now going around Microsoft: Teach, don’t sell. This means more focus on demos and proofs using Hack Culture – helping customers or prospects to build their skills, constructing POCs, introducing new tech, and generally sharing learnings. This provides the partners with invaluable opportunities to win mind share, as well as to articulate where they provide added value, and get useful feedback. And it’s easy to set up – if a partner offers a customer dev team the chance to sit down with their own developers to joint-build some scenarios, you can guess how attractive this offer is to the customer. Joe covered more on Microsoft helping SMB and mid market partners to Grow, Create, and Transform. For Growth: rather than count a whole range of metrics for SMB and midmarket, there is just one number Microsoft is focussed on: Cloud consumption figures in the CSP business. For those partners and customers who are operating on Enterprise licences, they are not being ignored, but the key initiative is to drive up CSP consumption. For Create, Joe outlined that in the UK there are now 25,000 Microsoft partners employing 560,000 staff. The key now is to help them focus to create new markets on the back of Digital Transformation and AI/ML – at the recent World Economic Forum in Davos, one of the key business themes was recognition that there is a one in a lifetime opportunity for massive step change through intelligent application of technologies in these areas. With regard to Transform, IDC asked how Microsoft and their partners can best work together to offer differentiated advantage, and how do Microsoft help modernise partners sales and marketing? 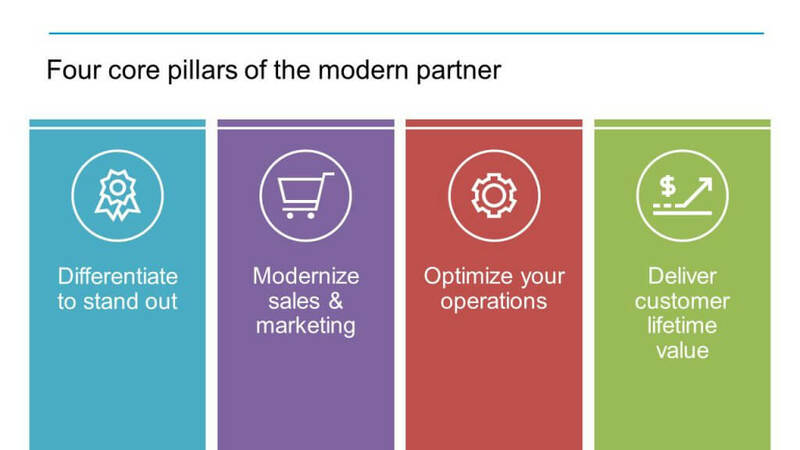 One area that some partners use very well, and most do not use at all, is Microsoft Partner incentives. Microsoft has a whole range of programmes that enable partners to attract funding from Microsoft for specific types of deals, sizes of deals, or combination of products. These can make a huge difference in helping a partner close a deal earlier, or grow a deal size for better customer benefit. At the eXtreme365 conference in Dubrovnik I was lucky enough to attend a session from Johan Jonsson, Dynamics Incentives Lead at Microsoft Corp. He covered the various programmes, where they applied, how to leverage them, and how they helped partners win deals. 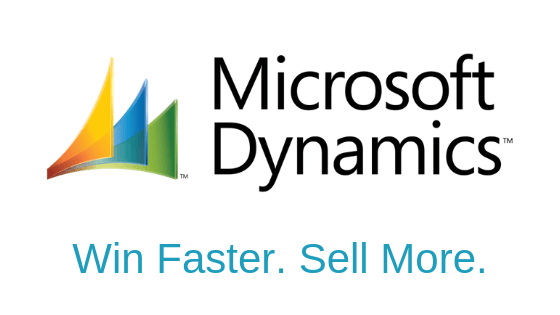 For certain combinations of products, at specific times in the year, the programs can be very generous and really help partners and customers build a very cost-effective Dynamics 365 solution. That’s got to be worth finding out about. Back to Twickenham Stadium, Angela Evans and Chris Rothwell double-handed a really useful session on the size of the market opportunity in UK SMB and Mid Market (SMB – 5m firms, $2-26k average spend, Mid market 10-500 staff, 240k firms $117k-5.5m spend on IT), and some great tools and programs that Partners can leverage from Microsoft. Chris is Dynamics Business Group Director and touched on a huge subject which needs a lot more focus than I can give it in this short article – so keep an eye out (or subscribe to our newsletter) as there is much more to follow: Enabling Digital Transformation. Using Modern Workplace as an example, he encouraged partners to think how to bring together the various solution spaces of Business Applications, Infrastructure, Data and AI to address empowering employees, better engagement with customers, optimising operations, and transforming products. As Chris explained, Microsoft’s range of technologies put the partner community in an unrivalled space to build successful businesses in this area. Integration for business advantage is the key: combining Office 365 with Dynamics 365 and partner-built solutions can achieve far greater results when effectively integrated for business solutions. A simple example is removing subjectivity from sales forecasts. Imagine a deal is slated to close this month. By using data insights and AI to look at emails and other communications sent/social articles published/calls made to the customer and whether the customer engaged and opened, when did your team last meet them, have you got access to power, etc, various subtle and not so subtle tests can be made about the likelihood of that deal happening as forecast. If the customer hasn’t reacted to anything you’ve done for a few weeks, the system can predict that deal won’t be closing this month. Even better, plugging in Azure Machine Learning means that the links between these causes and effects can be better understood and then effective suggestions can be made to the sales teams about engagement strategy and accurate forecasting, so the team learns and improves as well. That’s really effective use of combined technologies. 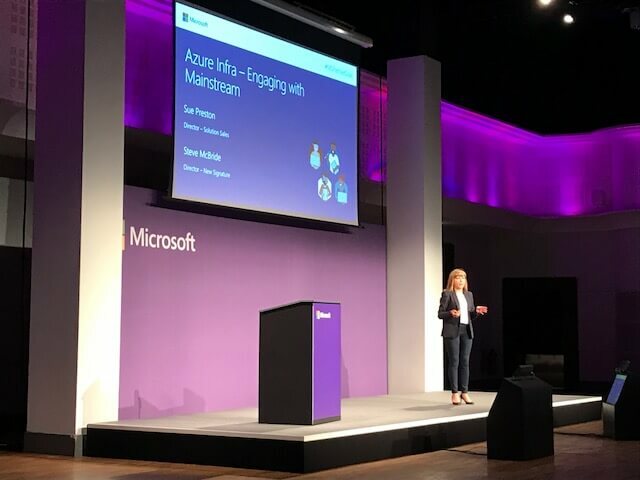 Angela is Office Business Group Lead UK, and explained that, to really take advantage of the cloud, Microsoft and partners have to change the way they sell. It’s so much more now around understanding customer priorities and showing easy-to-deploy solutions that really prove value early. Value calculator (VC) which helps you calculate the expected return on investment (ROI) and cost savings for your digital transformation. As Angela asked the crowd, ‘Who doesn’t want larger deals, closed earlier?’ No hands went up.